As the founder of a video interviewing company, I’m often asked how video interviewing is different from a service like Skype. The simplest response would be to relate the question to Facebook and LinkedIn. Why have an account on both? If you ask most people, the answer you’ll receive is “I use Facebook to interact with my friends and LinkedIn to network with my professional contacts.” It’s a digital separation of one’s personal and professional identity. The same holds true when comparing video interviewing services to video chat platforms–Skype is for personal use and our video interviewing services are for professional use. However, the fact of the matter is there are many benefits of integrating video interviewing services over video chat platforms in your hiring process. Today’s post will take a look at a few of these benefits. 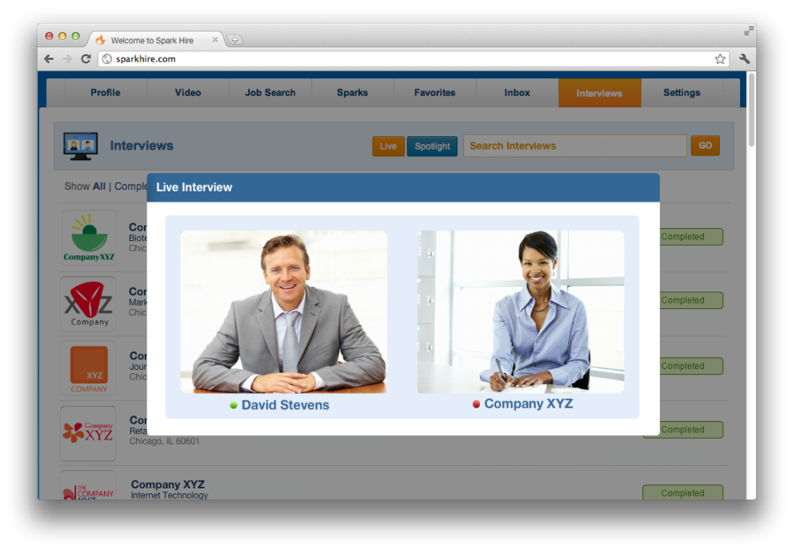 One-Way Video Interview: an asynchronous virtual interview in which an employer sends text-based interview questions to a candidate who records and submits video answers. 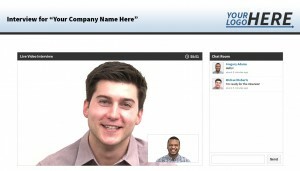 Live Video Interview: a cloud-based (in your web browser) virtual interview in which an employer and job candidate connect face to face via webcam. Video Chat and Video Conferencing: often confused with live video interviews, video chat or video conferencing is a live webcam interaction between multiple parties. Now that we know how to define these terms, let’s begin the examination of how video interviewing services differ from video chat platforms like Skype. At first glance, you may be wondering where the real distinction lies between the two options. After all, they both require a webcam and help you connect face to face with another individual. With live video interviews (as seen on Spark Hire), candidates are invited via email whereas many video chat services require you to connect through personal usernames. Also, live video interviewing solutions are in the cloud while many video chat services are desktop-based. But, let’s dig deeper. When individuals unfamiliar with video interviewing hear about the technology for the first time, they instantly think of live video interviews. However, many organizations who employ video interviewing technology enjoy one-way video interviews the most as they save an unbelievable amount of time. 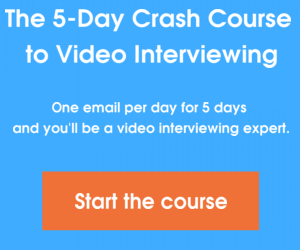 With one-way video interviews, recruiters send text-based questions to candidates who record video answers and submit them back to the recruiter. Just imagine being able to sit back, relax, and watch dozens of interviews at your own convenience. One-way video interviews enable organizations to screen candidates on their own time–something not possible with video chat. Without the use of additional pieces of software or plugins, a video chat cannot be recorded so the conversation ends with nothing to show for. Live video interviewing solutions, more frequently than not, do give you the ability to record and playback all that transpired during an interview. Thus, the conversation never ends. You have a recording to refer back to and any colleagues who couldn’t make the interview can watch it when it’s most convenient for them. Recruiters, hiring managers, business owners, and anyone else involved in the hiring process can appreciate this nifty feature as it fosters collaboration and makes it much easier to get a second opinion. Lastly, and perhaps most importantly, let’s talk about candidate experience and employment branding. It’s important that your candidates have a positive experience when interviewing with your company because they’ll likely share their experience with their friends, family, and even post on various social sites. In the hiring process, your candidates evaluate your company just as you evaluate them on their qualifications so it’s important you give them a good experience. Video interviewing solutions lend themselves much better to candidate experiences and employment branding opportunities than video chat because video interviewing solutions are built for the hiring process. On Spark Hire, your candidates receive branded interview invitations containing information about your company and the job they are interviewing for. They are also able to create a dynamic profile detailing their qualifications for the job which you can view when watching interview recordings. With video chat, your candidates connect with you in the same way they would with a family member living across the country. If you want your candidates to be excited and engaged, give them a nice, branded experience with a video interviewing solution. So let’s recap: one-way video interviewing for the time-conscious interviewer, increased collaboration with recorded live video interviews, and an amazing candidate experience and employment branding opportunity. You ask: what’s the difference between video interviews and video chat? I ask: besides the video, what’s the same?